Dr. Peggy Oster is a Professor of Psychology at a small university in Kansas. She likes the life she's built for herself there and is looking forward to a summer with nothing more pressing to do than indulge in her secret passion: watching old movies and classic sitcoms. However, all that changes when Robert Reynolds, a colleague who bears a striking resemblance to Michael J. Fox, challenges her to add some paranormal psych classes to the school's fall catalogue. After reading an old leather-bound book on the subject, Peggy embarks on an adventure in a strange world that's populated with celebrity lookalikes, mythological creatures, and a royal court that mistakenly assumes Peggy is a doctor of medicine. There's even more Trouble in Paradys when the handsome-but-inept magician, Xandro, returns to the castle just in time to hear the king give Peggy his job as Court Wizard. It all makes for one summer vacation Peggy is unlikely to ever forget. 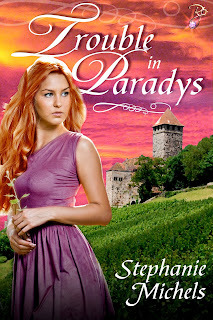 Trouble in Paradys by Stephanie Michels is a paranormal romance from HEA Publications available soon for Amazon Kindle. Okay, I never thought it would happen, but I finally did it. After 32-1/2 years working at the same company, I gave my notice, handed in my security badge and took my early retirement. Wow! I've been working full time since just before graduation from high school. I took a few weeks off with each of my kids, and then it was right back to it. When I moved here in 1979, I started working for my last employer and never left. Looking back on it, I realize I've spent more than 1/2 my live working there. That's a shock! I don't really regret the years -- I made a lot of friends there and got to try a lot of new things and learn new skills...but wow! Half my life??? I think it's long past time for me to follow my dreams. Life is too short not to choose to be happy, and my bucket list is waiting. Retiring might not have been the soundest financial decision I've ever made, but I am the master of my Fate and this is MY decision. So I will take off my shoes and walk in the sand, stay up late writing or sleep in if I choose, and I'll look for fun in everything I do.